Has Ranma 1/2 lost its steam or are there bigger and better things to come? We all know Ranma 1/2. It is one of the series that has defined American fandom. So it was with great pleasure that I sat down to watch the misadventures of Ranma, Genma, Akane, Shampoo, and the rest. For the uninitiated, Ranma 1/2 centers around Japanese teenager Ranma Saotome. Son of Genma, a member of the Anything Goes School of Martial Arts, Ranma is the heir to a debatable martial arts legacy. As such, the duo goes on a decade-long training trip to China - despite the fact neither of them speak a word of Chinese. Their training mission takes them to the cursed Jusenkyo springs. In the course of training, both Ranma and Genma fall into the springs and are cursed to turn into who or whatever drowned in the springs, when splashed with cold water. The effect is reversed when the cursed person is splashed with hot water. For the affable Genma, being turned into a panda is not so bad. However, for the headstrong and proud Ranma, being turned into a girl is much less reasonable. From the creator of Urusei Yatsura, Rumiko Takahashi, Ranma 1/2 builds on the successful formula of girl meets boy (girl), and grudgingly falls in love with him (her). 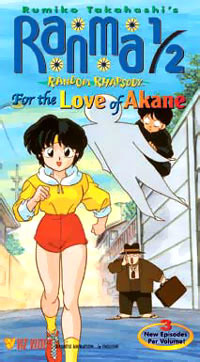 This particular VHS is "Random Rhapsody" (more or less equivalent to season six of the Ranma 1/2 TV series) and is titled "For the Love of Akane." As such, the tape's three episodes deal with everyone's love for Akane, the youngest of the three Tendo daughters, and the one betrothed to Ranma. For fans of the series, the collection is a mixed bag. By this time (season six), the venerable series has begun to show its age - I've had nearly endless debates on where exactly the Ranma 1/2 TV series turned sour - I've heard anywhere from season three to six. But by six, the "out there" concept of the series is beginning to strain underneath the weight. It's not that it is particularly bad, but the later seasons lack the flair and charm that the first several had. They seem more formulaic - they're done just for the sake of being done and no new ground is broken. This is very apparent on this tape, as the first two episodes, "Gosunkugi and the Magic Paper Dolls" and "Akane's Unfathomable Heart" deal with largely the same idea. In the former, Gosunkugi, in a bid to win Akane's heart, receives mysterious paper dolls - write what you want done and put them on someone's back and he or she will do it. This causes a headache of a day for Ranma. In the latter, Ryoga attempts to use a psychic to prove Ranma doesn't love Akane. The last episode deviates from the formula a bit - "Master and Student...Forever?!" features the old goat Happosai attempting to make Ranma the perfect martial arts student. In classic Ranma 1/2 fashion, however, Happosai gets more than he bargains for when he's stuck to Ranma's belly. As mentioned before, by this time, the series had been getting a little stale. While the episodes on this disc are able to capture some of the wit and charm of the earlier episodes, for anyone who's already seen the early stuff, "For the Love of Akane" will seem like a walk through familiar territory. The presentation is overall pretty good. It is a bit unfulfilling - there are no extras (which is to be expected from VHS tape of a series) and there are only three episodes. The box seems a little unprofessional in its writing style - having fun with a wacky series is one thing, but it seems a little spastic. The tape's colors are surprisingly crisp and the classic series looks good. I watched the dub tape and it is pretty good work. I am almost always against the English dubs of Japanese anime, however, the English track of Ranma 1/2 is solid - the Japanese is fairly well translated and the English cast seems to both understand the series and be having fun with it. It is my favorite English dub. Overall, if you've got a DVD player, it might be better to pick up the DVD version of this tape - it has English and Japanese, plus longevity of a DVD disc. But if you're still condemned to the hell of VHS tapes, Ranma 1/2 can ease the pain.